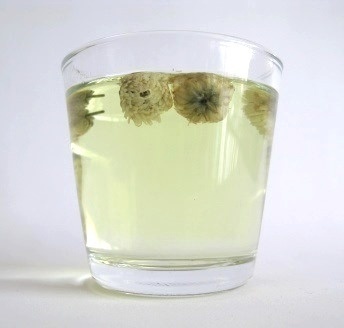 Chrysanthemum tea is a floral infusion that is very famous in Asia. Made from the golden flowers of this plant, this is a tea with a long history in traditional medicine. This is a cooling tea that is delicious, healthy and soothing. Ideal for colds and other ailments, bringing down a bad temperature while fighting infections in your body. Come and learn more about this incredible tea! Chrysanthemum is the name given to the flower and plant native to Asia and northeastern Europe. There are many species of chrysanthemum, most originating in China, but the tea is usually made from chrysanthemum morifolium or chrysanthemum indicum. Commonly called mums or chrysanths, the word "chrysanthemum" actually comes from the Greek words for gold - chrysos - and flower - anthemom. In Chinese, the name for the yellow variety is Ju Hua. This herb is a perennial shrub with nice leafs with toothed edges and many beautiful daisy-like flower heads crowned with several layers of white, yellow or red petals originally, although today many other colors have been bred for decorative purposes. It may be found growing in the wild as well as in gardens and flower pots. They add a wonderful burst of color to any garden and are considered to be quite resistant. The best quality chrysanthemums are the ones with a subtle rich flavor and richness of health benefits as well. And of all the species of chrysanthemums, the one that is best to make tea has small yellow buds. Chrysanthemum tea has been brewed in Asia for thousands of years, playing an important role in traditional medicine and as a delicious and nourishing beverage. It is believed that it was first cultivated in China in the 15th century BC where it was revered by poets and artists. Chrysanthemums were a symbol of nobility and integrity. As a herbal tea, it was first brewed and popularized during the Song Dynasty (960 AD - 1279 AD) and for centuries it was used to treat respiratory issues, blood pressure irregularities and to calm the nerves. This flower was only brought over to Japan in the 8th century AD, where it was adopted as the Emperor's official seal and the symbol of the imperial throne. Today these flowers still have many symbolic meanings, in European countries they are associated with death, in some Asian countries they stand for lamentation or grief, and in other places they are viewed as positive and cheerful symbols. Chrysanthemum tea is still consumed by millions of people in China, Korea, Singapore and Japan every day. It is a favorite summer tea, loved for its cooling effect on the body as well as its traditional health benefits. You can either purchase the dried flowers, tea bags or the many sugary versions of this tea in soda cans or juice packs. Chrysanthemums are also steamed or boiled and eaten in salads. The leaves are particularly appreciated as a vegetable dish. Flowers and leaves may be added to stews or soups in Asian cuisine as it is said to help thicken the liquids. Chrysanthemum tea is a cup filled with healthy components, such as vitamins A, B, C and K, beta-carotene, calcium, fiber, iron, magnesium, niacin, phosphorus, potassium, riboflavin, sodium, zinc, amino acids and glycosides. This blend of components makes this tea not only tasty, but good for your health as well, and you may drink it to reap a number of benefits. Chrysanthemum tea is rich in vitamin C, an essential element that may help in the treatment of colds and the flu, warding off symptoms in the early stages of the disease: such as headaches and rising temperature. This herbal tea is a natural coolant, making it ideal to drink when you have a fever as it may help to cool down your body quickly. Add a bit of honey and this tea may soothe a sore throat, fighting bacterial infections. Chrysanthemum tea is said to speed up recovery time. Drink this tea when you have trouble breathing, vitamin C in it may relieve congestion, strengthening lungs and aiding when you are suffering from sinusitis and shortness of breath. It may clear away phlegm and calm the lungs. Its antihistamine properties make this tea great to prevent allergies. The cooling nature of chrysanthemum tea is not limited to fever; it may also help when you are suffering from heat stroke or other forms of internal temperature imbalance. As we age, it becomes normal for temperature to rise in the body. For example, women undergoing menopause may suffer from hot flashes that quite uncomfortable. This tea mat help to dissipate this body heat in a way that is natural and safe. The best thing is to drink this tea during the hot summer months, when it seems impossible to stay cool, but at the same time chrysanthemum tea is said not to hinder your digestion. This cooling herbal tea is also said to help prevent heart problems. Drinking chrysanthemum tea may improve blood flow, reducing blood pressure and treating blocked arteries and varicose veins. It may also help allay symptoms associated with high blood pressure, such as headaches and dizziness. A regular cup of this floral infusion may help reduce chest pain, treating angina, and atherosclerosis, but make sure to talk to your doctor to make sure this is the proper form of treatment for your heart problems, particularly if you are on medication. It may be that drinking chrysanthemum tea may help lower bad (LDL) cholesterol levels, thus preventing heart disease. 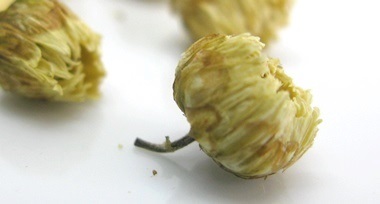 Chrysanthemum tea may be used as a means to detoxify the liver. By improving liver function, you are also helping your body to better cleanse your blood of toxins and harmful agents. It is said that this tea actually protects the liver. This is considered a balancing tea, because when you use it to cleanse the liver you are improving the health of the organ responsible for balancing hormonal production, thus helping to prevent and treat nervous disorders and mood swings. Other organs that also benefit from the detoxifying effect of this tea are the kidneys. It helps to flush out bacteria and toxins that could be at the source of infection. Drinking this tea also helps to boost your immune system as chrysanthemums have antiviral and antibacterial properties. This means that not only you recover from illness faster, but you will be less likely to get sick, too. Chrysanthemum tea may be enjoyed at any of the day, but it may be ideal to have with a heavy meal especially when greasy foods are on the menu. This wonderful helps to ease digestion and stimulate the stomach to process fatty elements more quickly. Indigestion and upset stomachs happen to all of us at one time or another. When this happens to you make a cup of unsweetened warm chrysanthemum tea to ease the pain, reduce the nausea and getting your stomach back into proper working order. Note: consider blending with chamomile for enhance digestive function. As this herbal tea boosts your digestion, when you drink it unsweetened, it is a way of promoting weight loss. Chrysanthemum tea contains vitamin B that helps the body to process fats faster and to eliminate them more quickly, too. One of the better known benefits of chrysanthemum tea is its potential for improving eyesight and bringing relief to general eye problems. This tea is believed to improve vision, reducing eyestrain and red eyes. This may be important for those working in front of a computer for long hours. Try drinking this tea when you feel so tired that your vision becomes blurry and your eyes feel tired and dry. Something that may happen when you work in closed environment with air conditioning all day long. Note: if your vision continues to be blurry even when you are not that tired, then it may be time to get your eyes checked. You may need glasses, sorry! Dust in the air can get into your eyes and cause stinging pain, irritation and constant watering. Watering is the defense mechanism your eyes have to try to push out dirt. So get a clean cotton ball soaked in a cooled infusion of this tea and very gently clean your eyes. It will clean and relax you. It is possible that drinking this may help those who with type 2 diabetes. Chrysanthemum tea show promise in lowering and stabilizing blood sugar and increasing your body's sensitivity to insulin. The balancing and detoxifying nature of this herbal tea may also be helpful for the nervous system, calming and soothing the nerves, clearing the mind, relieving tension headaches and dizziness, even treating insomnia. At the same time, this tea is also considered an energizing tea. While it is caffeine-free, it stimulates you naturally and it may also help you to rest better at night, improving your energy levels the following day. It helps you to stay alert and focused without the need for addictive caffeine. Drinking this herbal tea may rejuvenate the brain as it may help you when you are particularly tired from too much work and stress. It is said to be beneficial for the memory under conditions of mental fatigue or neurodegenerative diseases. Chrysanthemum tea also contains analgesic potential, meaning that it may soothe pain, such as that caused by migraines and headaches. Toothaches and gum soreness may also benefit from a cup of this tea. Just remember to drink your tea unsweetened! There seems to be some promise that chrysanthemum tea may help prevent the onset and spreading of cancer. This is directly related to the presence of flavonoids (natural antioxidants), triterpenoids and fatty acids. Triterpenoids and flavonoids have antitumor properties, preventing mutation and damage to DNA at the cellular level. Some of the fatty acids present in this tea are said to be responsible for the death of cancerous cells, so there may be hope for this tea as a form of treatment. Of course, there still needs to be a lot more scientific study into this matter, but it seems to show that there may be hope at least as a form of disease prevention. Chrysanthemum tea may have improve your skin health whenever your drink it or apply it topically. By drinking this tea you are keeping your tea hydrated and young, preventing premature aging that comes from exposure to dryness, wind or heat. With each cup of tea you drink, you clear away toxins that affect your skin or balance hormone production that could be at the heart of some topical issues, such as acne or pimples, particularly when these are stress-related. Applying it on your skin may help clear acne, wounds or boils due to its antiseptic properties. It may aid in cleaning and healing inflamed bruises and sores. Being rich in vitamin C, makes this the ideal tea to protect your body as well as leave you with a healthy complexion with less wrinkles or other signs of aging. By fighting infection, it also helps soothe irritation and possible skin reactions. 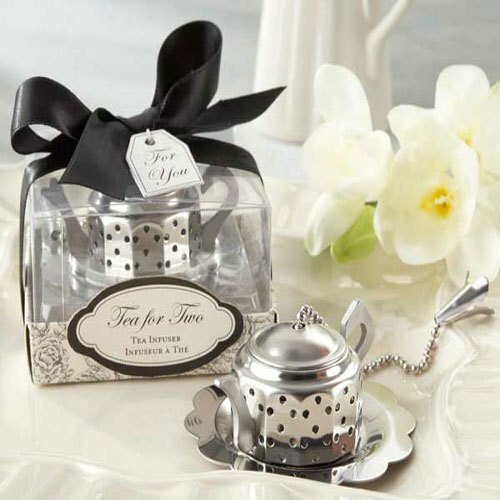 Cool down with this floral tea now! When drinking this herbal tea there are some facts that you should be aware of. Chrysanthemum belongs to the same family as ragweed, marigolds and daisies. If you are allergic to any of these plants, there is a good chance that you may be allergic to chrysanthemum tea. You may experience difficulty breathing, asthma, hay fever, or experience a skin rash. When harvesting these flowers, it is best to wear gloves as the plant releases chemicals that could provoke contact dermatitis and photosensitivity. The first symptoms are red and inflamed patches of skin. This may be a sign of allergic reaction. If you drink this tea on a regular basis and have light skin, then make sure to protect yourself with sunblock cream as sensitivity to light may increase. Not everyone experiences this side effect, but if you have light skin and eyes, it is best to be safe than sorry. If you are pregnant or breastfeeding, then it is best to avoid this herbal tea unless recommended by your doctor. There simply isn't enough information to make this tea is safe for you at this stage. When taking prescription medication it is always best to talk to your doctor before drinking this tea as it may alter the way your body processes the medication. For example, medication with sedative effects or that lowers blood pressure in combination with this tea could be harmful for you. If you are taking insulin to treat diabetes, then it is best to follow up with your doctor about drinking chrysanthemum tea. Your doctor may either tell you to avoid it all together or wish to monitor your progress more attentively. There is a certain danger of poisoning due to ingestion of this tea over a long period of time. Chrysanthemums contain pyrethrins, a chemical that may be toxic when ingested in large quantities. Toxicity may cause problems to the nervous system, eyes, asthma and inflammation. This cooling herb makes a wonderfully tasting tea filled with benefits, so it's time to enjoy a cup of this tea. Come and let's learn how to make chrysanthemum tea. 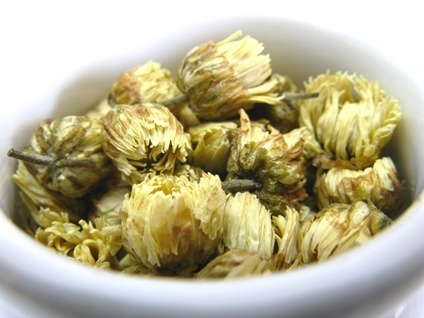 Chrysanthemum tea is made using mostly dried flower heads, although you may sometimes find leaves and stems mixed in. Start by putting the kettle on and bringing water to a boil (100ºC). Then allow the water to cool down to about 90ºC – 95ºC (194ºF – 203ºF). In a teapot, place about 6 to 8 flowers per cup of water (250ml) that the pot holds. Pour the hot water over the flowers let your tea steep for about 3 to 5 minutes. The longer it steeps, the stronger your tea will be. Strain your tea and add honey to taste. The resulting tea is light yellow in color with a great floral aroma and refreshing taste. It is quite pleasant and soothing. You may drink about 1 to 3 cups of this tea per day. If you wish to increase dosage to treat a form of ailment, then it is best to talk to your doctor or nutritionist first in order to come up with the appropriate number of daily cups of tea for you. Note: Ready-to-drink chrysanthemum beverages tend to be much sweeter, sometimes, a little too sweet. One we tried seemed to taste like diluted honey. Enjoy your tea and when you are done, you can refill the teapot with freshly heated water and resteep the chrysanthemum flowers for another serving of this delicious tea. Some Chinese recipes call for rock sugar instead of honey as a form of sweetener. Try it and see which you like best, just remember that honey is healthier and unsweetened chrysanthemum tea is very good, too. 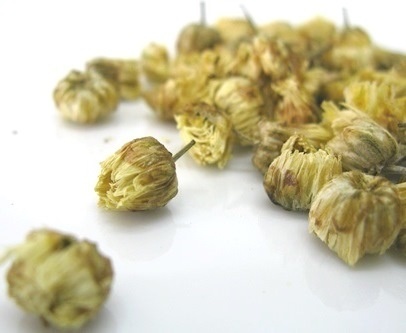 Chrysanthemum is such a lovely flower that you will often find it hiding inside green or black tea balls that create the effect of an opening blossom. 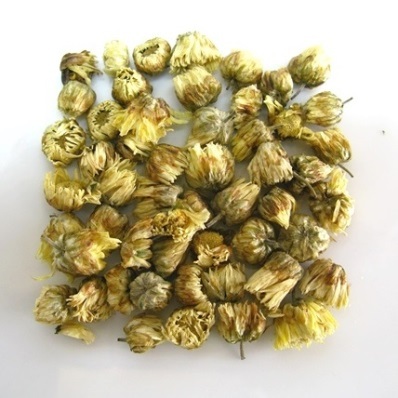 Learn more about these lovely flowering teas here. Alternatively, this herb blends really well with your regular green or black tea. If you are treating a cold, then blend your chrysanthemum flowers with peppermint, chamomile, or honeysuckle. Sweeten you tea with honey to reap the healing benefits of this sweetener, too. An alternative way to serving this tea is by allowing it to cool down or adding ice to it and serving it as an iced tea with a light meal. It is considered a great cooling beverage to have in the hot summer months. Add goji berries (also known as wolfberries) to enhance the benefits of your tea. Place 1 teaspoon of berries in water to rehydrate them prior to adding to your teapot. These berries enhance the liver detox and vision benefits. If you are lucky enough to have a garden with chrysanthemums, make sure that the flowers you pick to make your tea have not been sprayed with pesticides or other harmful chemicals. And you should properly wash your flowers, too. 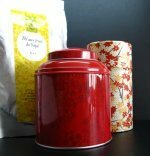 Buy Your Chrysanthemum Tea Today! 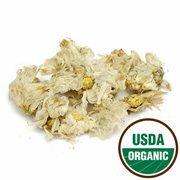 Click on the image or on the link below to purchase from Starwest Botanicals your organic chrysanthemums. 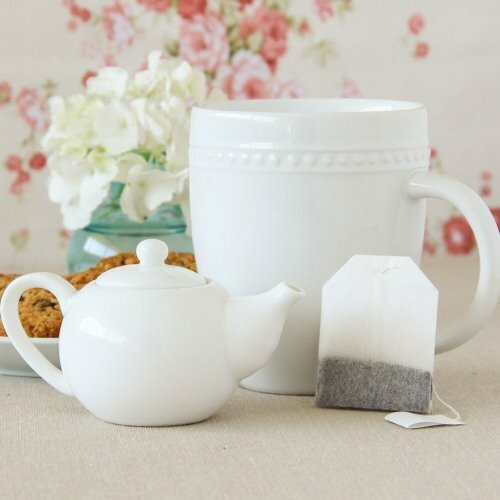 Make a cooling herbal tea with these dried white blossoms that is both tasty and healthy. 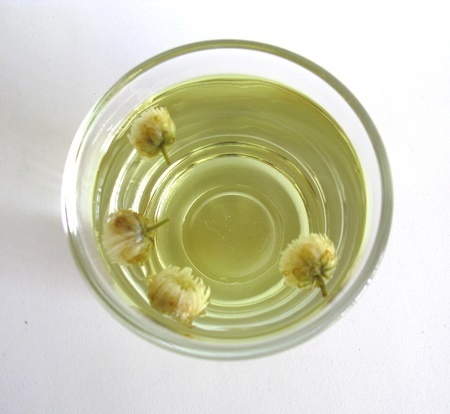 and check out flowering teas to have a chrysanthemum flower blooming in your tea! This is an interesting and cooling tea that you should definitely try. Have these beautiful flowers in your home ready to brew a cup of tea when you are sick. So let's cool down with this wonderful tea!